Remote employees are not a rarity anymore. Remote working has become a standard organizational practice in today’s day and age, with companies offering greater flexibility to their employees in terms of working hours and location. A 2017 report by PowWowNow states that 58% of UK workers are offered the option of flexible working. PwC has a strategy known as “All Roles Flex” which allows employees across all roles to choose their working hours by offering flexibility. This move aims at retaining the best staff and removing the ‘stigma’ associated with flexible working, especially for those who use it. Although flexible working has a positive effect on both employers and employees from a psychological, mental, physical and economical standpoint, there are two important potential issues that can affect remote employees. Organizations should be aware of this and watch out for the signs. There are ways in which companies can help prevent these issues from hampering productivity and employee wellbeing. Burnout basically means employees pushing themselves to the point where they run out of fuel and cannot function anymore. This is more common among remote employees because of a sense of gratitude towards the employer which can easily turn into ‘indebtedness’. Often, employers also burden their remote workers with more tasks than they can complete in a given time frame owing to an assumption that they have more time since they work from home. Either of these situations can quickly result into a remote employee running out of physical and mental energy, leading to a burnout. It hampers creativity, engagement, and productivity. Not the best outcome. So how can companies help tackle this? 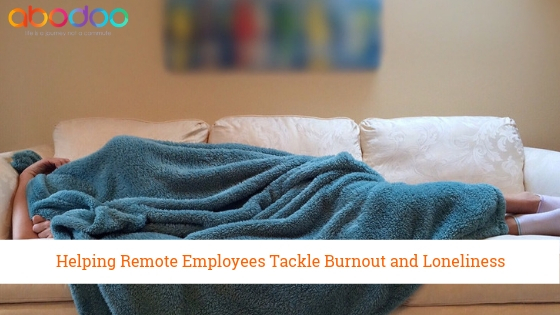 By checking in with their remote employees and ensuring that they are doing okay. Managers and leaders should have non-work-related conversations with employees and take a genuine interest in their lives. Employees should have time to connect with their families and indulge in activities that make them happy. Ensuring a balance between work time and private time will help reduce burnout. Loneliness, on the other hand, is a common issue affecting remote employees because of their general lack of interaction with colleagues. People who work from home do not form personal bonds with their colleagues because of a lack of face-to-face interaction. Companies should create policies for weekly meetups so that remote employees get to know each other and the team. This builds rapport and generates trust. It makes them feel part of a community, which is essential for all human beings. It is said that employees are a company’s greatest resource. Hence, it is pertinent that organizations ensure the wellbeing of their remote employees. A happy workforce leads to greater organizational success.